At times,I am hooked to the internet so much so that I postpone everything else and sit glued to my laptop.As an afterthought,I take a self proclaimed break from my blog,facebook etc.I auto-publish the posts so that I am not tempted to open the laptop and tell myself ’its for the blog’!! But when the broadband decided to take a break,I realized how much I was hooked into it.Our landline and the broadband connection went dead some time back and didn’t show a comeback until today.I kept calling the customer care the first few days and then it kind of settled in.My books were out and so were my acrylic paints.There was life beyond internet after all. Whatever said and done,the moment the connection was back,I logged in and am posting this cake.I have so much to share and so much to catch up on.But for now,let me present this delicious Eggless cake I tried sometime back from Anushruti’s blog.I dressed it up a bit using some glazed cherries.Perfect as a tea-cake. In a saucepan,heat the milk. Stir in the sugar and after it melts completely set it aside to cool to room temperature. After the milk reaches room temperature, add the custard powder and mix well with a whisk. Put in the butter and mix again. Prepare the cherries – wash the glaced cherries in a strainer under running water and wipe them dry.Take a tbsp flour from the measured flour and mix well with the cherries.Keep aside. In a large mixing bowl, assemble the flour, baking powder, baking soda and mix with a whisk. Pour in the prepared milk mixture and mix well with a whisk until there are no lumps. Alternatively use an electric hand mixer/beater.Fold in the cherries. Pour the prepared batter into the greased cake tin and bake for 55-60 minutes minutes or till a toothpick inserted into the center of the cake comes out clean. As you can make out,my cake was a bit on the dry side because I slightly over baked it.Though it didn't affect the taste in any way,I am sure it would have been great if the cake was moist and not dry.So keep a close tab on the cake while it is baking. Like many of you pointed out,this cake is very similar to Eggless Custard powder Snack Cake.But different too.The latter has a more pronounced Custard powder flavor while this cake has a very faint one. wow! that looks yum! loved all ur pics. fab!!! The cake looks fab! Glad you chose this post after your internet break! Good to see you back, cake looks lovely.. I m in love wid ur bundt pan divya...whr did u get it? ?I have bought one but its a plain one without any design and I have not used yet.. 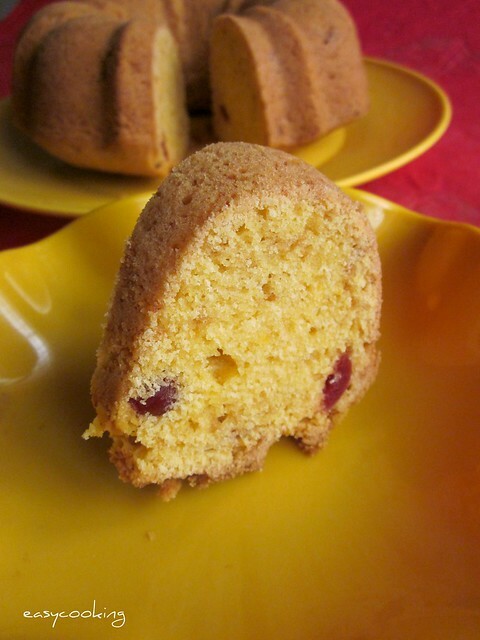 This cake reminds me of that custard powder cake of urs...looks yummy n perfect for snacking!! Wonderful,loved the colour and addition of glazed cherries.Bookmarking this to try..
Divya looks very nice loved the shape of the cake..
Looks mouthwatering and yummy cake..
wow so perfect...by the way khanche art work kelle with acrylic paints...send me pics pls..
Cake looks soft and yummy!! WOw wat a fabulous texture, soo spongy and fabulous looking cake.. I love Anushruthi's blog! Cake looks good! Great looking cake, Divya. Would you reccommend flavourless vegetable oil in place of the half-cup butter, as a healthier option? If so, what would the proportion of butter to oil be ? 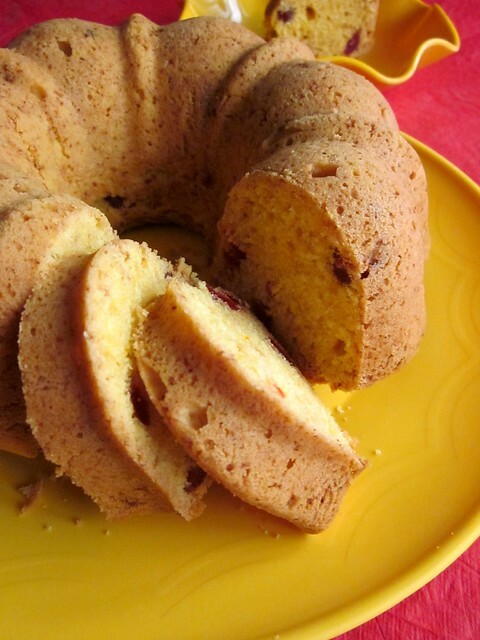 i was waiting for you to post this one..sounds so great with glaced cherries..will try this soon..
Cake luks fantastic...Perfectly done it...wondeful recipe. Lovely and yummy cake! Perfect as a tea cake, I'm sure! WOnderful - divine looking cake!! Life without the internet is unimaginable with us being so used to it. 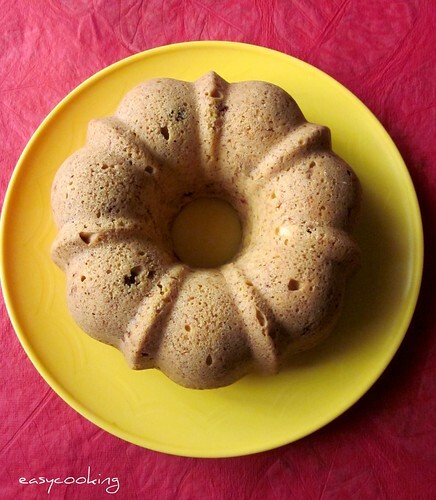 You have turned out a perfect bundt, the pics are great! I know there is life beyond internet Divya but what about people like who look forward to posts from you. Lovely cake. really golden in color. 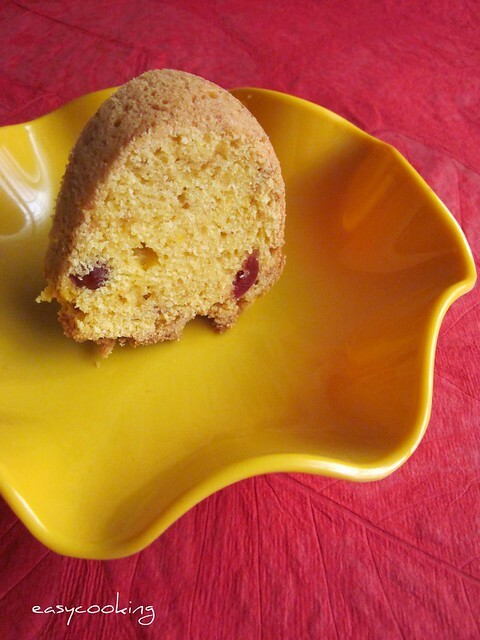 I love the bundt cake pan design too and the way the cake has been cut. so yummy. made my day girl. hi divya, Can I use oil instead butter? Hi Divvya, I tried this cake but turned a bit dry...guess the baking time made a difference. I baked it at 160 degrees for 40 mins. Should I reduce the time ?